Seeking an authentic paradise? Yes, this is your chance to really experience it. Can you imagine yourself swimming in the pools of private waterfalls located in remote untouched areas of an island? We can! On this unique Lombok tour, we will bring you to the unseen spots of this magical island. 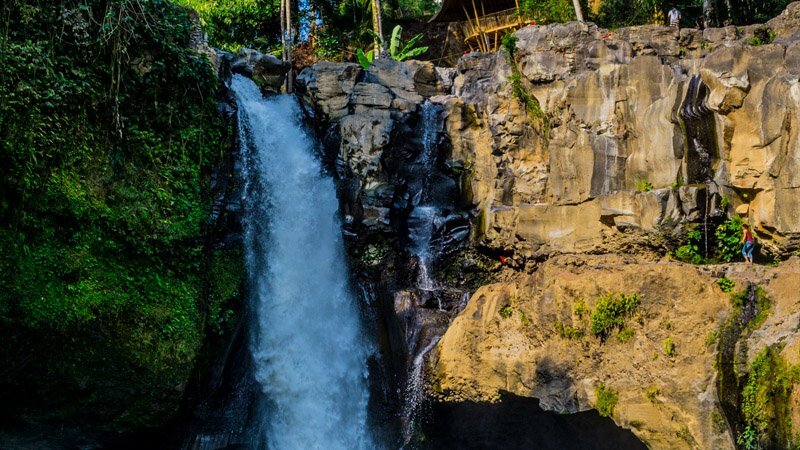 Lombok is an island paradise full of beauty, with a few private waterfalls just waiting for you to be explored. With a 4,514 square kilometer “playground” at your feet, the possibilities are endless for adventure and relaxation. The island was formed by ancient volcanoes, some of which still remain active. The largest being in the heart of Lombok, Mt Rinjani, towering above the clouds at 3,726 meters tall. Rinjani is the third tallest volcano in all of Indonesia, the last dangerous eruption was in 1994. The volcano is still active and ash can be seen spewing out of its caldera from time to time. The first settlers came in 1674 and established the Eastern half of the island. This left the southern half to be rich, tillable, agricultural land fruiting corn, rice, coffee, tobacco, and cotton. Lombok is also home to many of the worlds most breathtaking beaches and a nearly perfect climate year round. 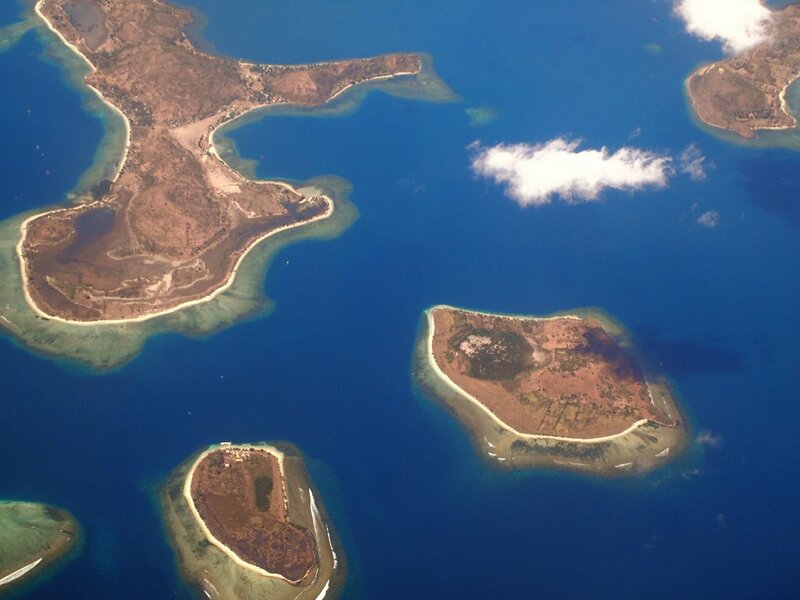 To clarify, the three Gili Islands are, Trawangan, Meno, and Air. Each island has its own communities and locals but the cultures and values are mostly the same. On Gili Trawangan, you will have options to get pampered in the spa, learn to stand up paddleboard, go kayaking, or even bicycle riding all before celebrating your magnificent day with an island party. Furthermore, as if spending time on these glorious islands wasn’t pampering enough, there is also a full-service spa for all of your relaxation and self-indulgent needs. Similarly, kayaking through the crystal clear sea may be as tranquil and relaxing as the spa treatment. Gili Meno and Gili Air are ideal spots for marine exploration. Snorkel and swim through the local fauna which is very distinct in this region due to its magical location along the Wallace Line. This line separates Asian Fauna and Australian Fauna and it happens to run directly through the Lombok Strait bordering the island. Who knew marine life had boundary lines? Among the islands, even the different birds tend to favor one side of the Wallace Line. It is astounding how special of a place in the world these islands really are, for us and the rest of natures creatures. 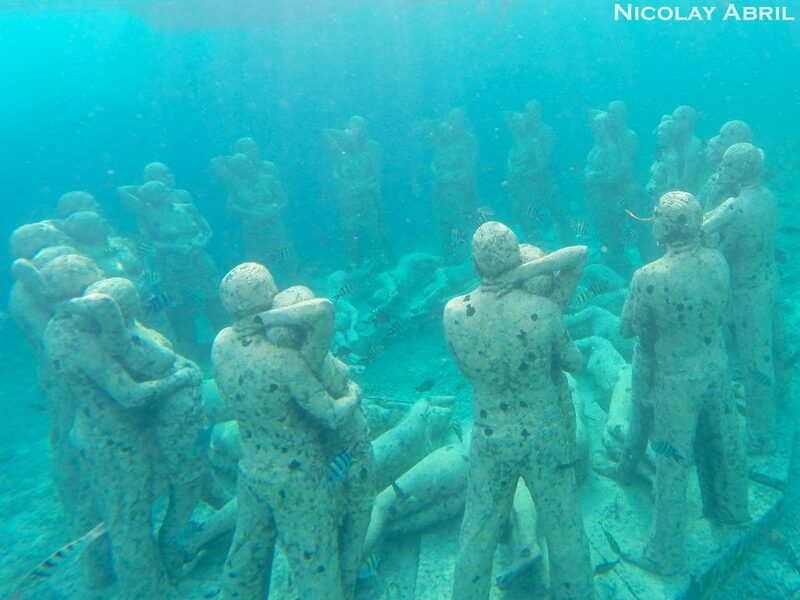 On our spectacular Lombok tour, you may also enjoy an underwater museum while you are exploring the depths and be amazed at the wondrous sculptures there on display. The sculptures were placed around the seafloor near the islands in 2014 for a variety of reasons. All of this and we are just closing up day two of your tour. Starting out the day three the Lombok Tour welcomes you to embark on an epic hike through some of the most untouched and remote jungles of Lombok. The hike in is an enchanting 1.5-hour walk. Strolling along you will experience sights and sounds that until now you may have only experienced through movies. A lush, brilliantly green forest full of exotic plants and colorful birds. Ridgelines with ocean views, each more amazing than the last. When you think you could not be more overwhelmed with this majestic setting, you arrive at the first of two private waterfalls. After your lovely stroll through the rainforest in the tropical climate, a dip in the natural pool here sounds quite inviting, doesn’t it? Go ahead, dip right in. Refresh yourself. Literally, soak in the beauty of your surroundings. Life is good. 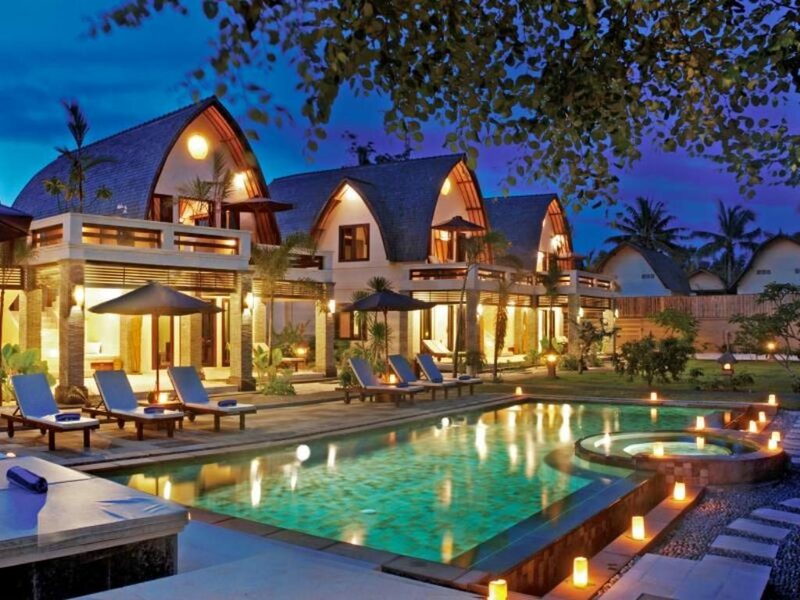 Check out more about Lombok and the Gili Islands here. Too often in our day to day hustle and bustle, it is easy to be consumed by our concrete jungles and not realize that places like this exist. In other words, places so remote and untouched, and now here you are right in the middle of one. Meanwhile, when you are through basking in the beauty and serenity of the jungle you will have worked up an appetite. 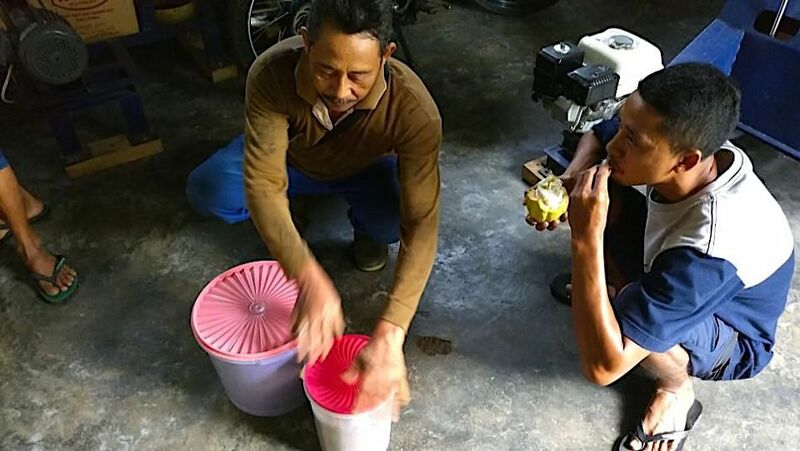 Time for lunch with the locals – travel Lombok in style! Secondly, sit yourself down and enjoy some local fare for lunch while socializing with some members of the community. Last but far from least, this day will be topped off with the miraculous sunset from Gili Air. Island, sea, breeze, and a sky on fire. Of course, you always have the option to venture on to other things while you travel Lombok, this is your getaway. Just remember no two sunsets are ever the same. Everyone has different wants and needs when staying away from home and these luxurious suites and villas each have slightly different features to accommodate that wide range of wants and needs. There are indoor pools, outdoor pools, private beach areas, and swim-up bars for the water enthusiasts out there. If you like a little nightlife there are restaurants, bars, and nightly entertainment on site or within walking distance from certain resorts. Even on the island free Wifi is a thing and exists at the hotels for all of your web browsing pleasures. Some of the resorts are geared toward the relaxation aspect of the luxury tour featuring on-site spas, sun terraces, outdoor BBQ’s, garden pools, helipads, and homemade breakfasts served to your semi-outdoor living/dining area. Caution: There is a high probability you will never want to leave your luxury islands tour – our Lombok tour will make those feelings happen. Feeling inspired? Contact us today to find out how we can make your next holiday incredible and unforgettable.